The winery Vega Sicilia elaborates this 1990 Vega Sicilia Valbuena 5º Año ($222.66), a red wine from Ribera del Duero produced with tempranillo, merlot, malbec and cabernet sauvignon from the 1990 vintage and shows an alcoholic content of 13%. 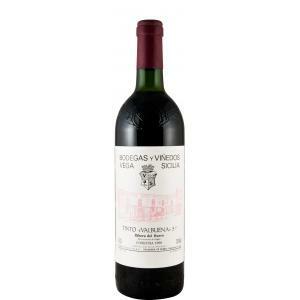 The 1990 Vega Sicilia Valbuena 5º Año is the ideal red to combine with foie and hard cheese. Uvinum users reviewed this red wine with 4 of 5 points. - Nose: licorice, cherry, cocoa and earth. - Mouth: tasty, well-balanced, soft tannins. If you want to buy 1990 Vega Sicilia Valbuena 5º Año, at Uvinum you will find the best prices for Ribera del Duero red wine. Buy it now at Uvinum, via your computer or your mobile device. We bring you the largest catalog of more than 59.000 products converting Uvinum this way into a leader in Europe with more than 38.000 customers who trust us.